Many poets love food and many foodies love poetry. 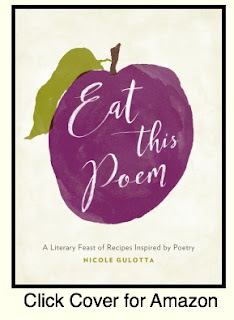 So a cookbook that includes recipes and poems seems like a natural combination—a most delightful one in Nicole Gulotta’s new Eat This Poem: A Literary Feast of Recipes Inspired by Poetry. Gulotta’s book evolved out of her blog of the same name. I discovered the blog some years ago and was delighted by the recipes, the poems, and the photos. I sent in some poems and soon “Blueberry” appeared with Nicole's recipe for blueberry buckwheat pancakes. Eventually, Nicole began blogging about her dream of doing a book. Eat This Poem is the realization of that dream. I like the size of this book (6 x 9, 205 pages) and its French flaps which make it easy to mark your place. I like the artwork that appears throughout. I like the symmetry of the unusual organizational plan: five sections each broken down into five parts. Each part begins with a poem by such poets as me (! ), Mary Oliver, Louise Gluck, Jane Kenyon, Billy Collins, and Philip Levine. Each poem is followed by a brief and excellent commentary, and then by three recipes. The author likes fresh food, natural organic products, and out-of-the-ordinary recipes such as Mushroom and Brie Quesadillas, Shepherd’s Pie with Sweet Potatoes, Pear and Manchego Grilled Cheese, and Strawberry Birthday Cake. Gulotta has studied poetry and traveled extensively sampling and studying different cuisines. Her love of poetry and good food is evident in this wonderful cookbook which is deliciously priced at only $18.95—currently on sale at Amazon at $10.47.